Sheepish grins, embarrassed blushes, and nervous giggles follow. I know I need to give my students some tangible reminder of why they need to be reading two hours per week. Objectives — Using the language of the Depth of Knowledge Levels: Calculate how much you can read in two hours; Estimate how your reading rate will change over a two-hour time period; Assess your own reading fluency and growth. Or, from the Common Core: Read and comprehend complex literary and informational texts independently and proficiently. Lesson — We begin class, as always, with independent reading. I ask students to pay attention to what page they’re starting on and start a timer for 15 minutes on the board. At the end of the 15-minute reading period, I ask students to count the number of pages read and multiply that number by eight to calculate their reading rate. They complete their calculations and jot down their reading rates as I pass out paint strips and Sharpies. I ask students to take out their phones and look up a quote about reading. Once we all choose quotes, I model on the document camera, writing my chosen quote on my own paint strip. Students grab some Sharpies and a paint strip in their favorite color and doodle their quotes on their paint strip bookmarks. “What about if you read a harder book?” I ask. “Um, I think I’d probably start out slow at the beginning, but as I get into the book, I’ll read it faster,” Shailyn adds. Follow-Up — Now that students have a tangible reminder of their reading homework to use as a bookmark, they can hold themselves more accountable. The quotes give them a rationale for reading, and the written reading rates give them a reminder of their reading goals. By self-monitoring both, students can assess their own reading progress far better than I can, and we’ll confer about that self-assessment during class for weeks to come. 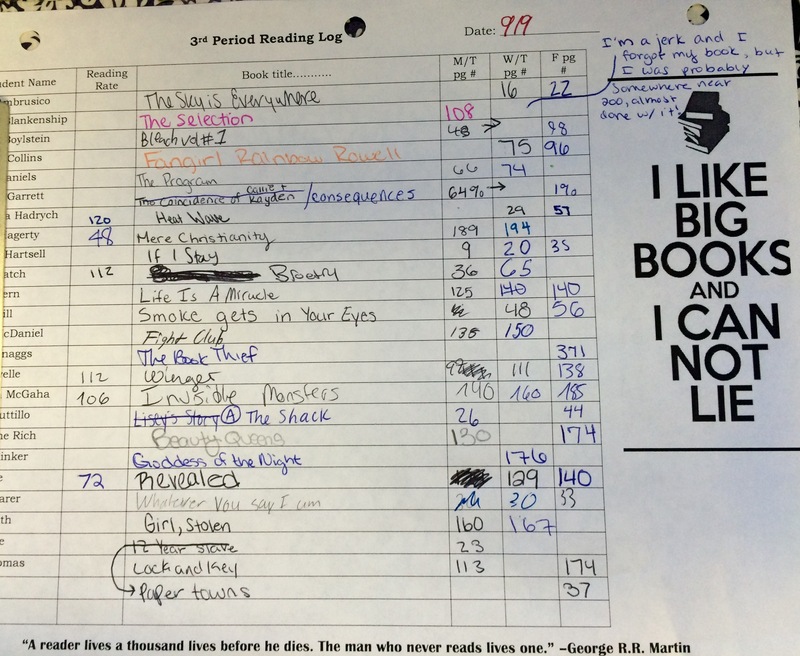 How do you grade their independent reading in your gradebook? I have my students calculate reading rates/page goals, as well, but when a student doesn’t do their reading in order to meet the goal, I am stumped as to what the homework grade should be in my online grade book. I just talked about calculating reading rates/page goals today with my students! I like the idea of writing it on a bookmark. I have them keep track of their weekly rates on a chart, but this is even more in their face. Thanks for the inspiration! (It also gives me a reason to swipe a bunch of paint samples from the store, which I love doing from time to time even if I’m not painting anything at my house. Haha). As a now retired a teacher, I heard from so many, “Oh, how I wished I’d had you as a teacher.” Well, you are one of those whom I’d wished I’d had!! !